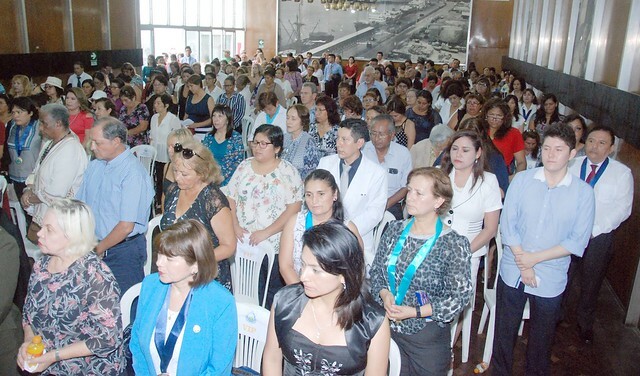 Lima, Peru—The UN International Women's Day 2019 was observed in Peru with a forum held on March 6 in the auditorium of CONACO (the National Federation of Merchants), which is located next to Peru’s Congress in the center of Lima. The room was packed to capacity with more than 200 guests. Unfortunately, due to the lack of space, another 100 guests were unable to enter. Gen. Hector Jhon Caro, a former police chief who captured the leader of the Shining Path terrorist group in 1992. Dr. Teresa Otiniano, a lawyer, political activist and consultant to the North Korean Embassy in Peru. Dr. Trevor Jones, president of UPF-Peru. Mrs. Faith Jones, president of the Women’s Federation for World Peace (WFWP)-Peru, an affiliated organization. Peru’s minister of women and vulnerable populations and minister of development and social inclusion had both accepted UPF-Peru’s invitation to speak but, at the last minute, the president of Peru called them to attend a meeting with him. However, the following day, Dr. Jones and representatives of UPF-Peru met with the minister of development and social inclusion in her office and shared with her details of the forum and the chapter’s activities. They also discussed the signing of an agreement to work together for the disadvantaged people in Peru. Also, 15 new Ambassadors for Peace were appointed and a number of Ambassadors for Peace were recognized during the forum for their outstanding contributions in 2018. As well, various professionals were recognized for their work in society.